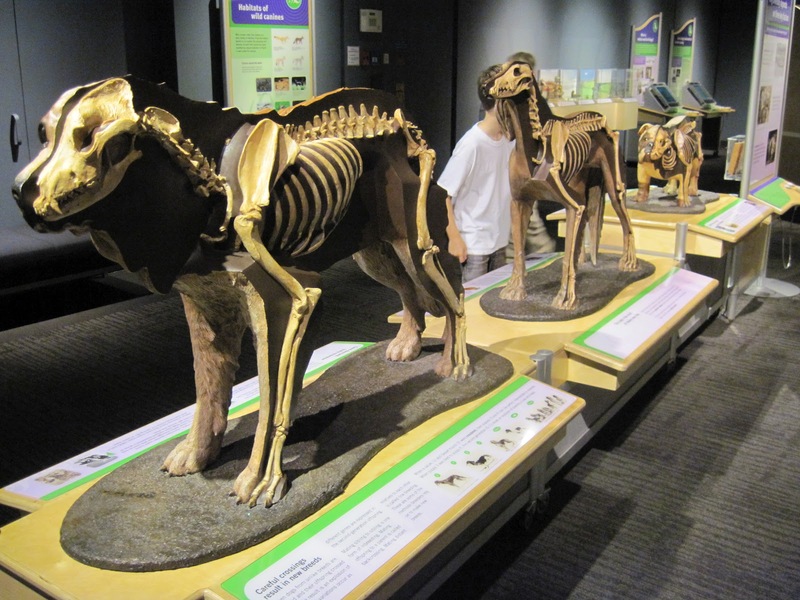 The exhibit opens with the wolf ancestry of domesticated dogs and showed the variety of shapes and sizes of modern dog breeds. I liked these creepy cutaway dog skeletons, which show some of the differences in the skeletons of a St. Bernard, saluki, and French bulldog. There were quite a few models of dogs throughout the exhibit which were just slightly uncanny – I think it might have been the way that fur was sculpted and textured, that just made them feel slightly…slimy. It’s hard to describe. The domestication of dogs from wolves was explained in detail, but there was actually very little on the evolution of canids as a whole. 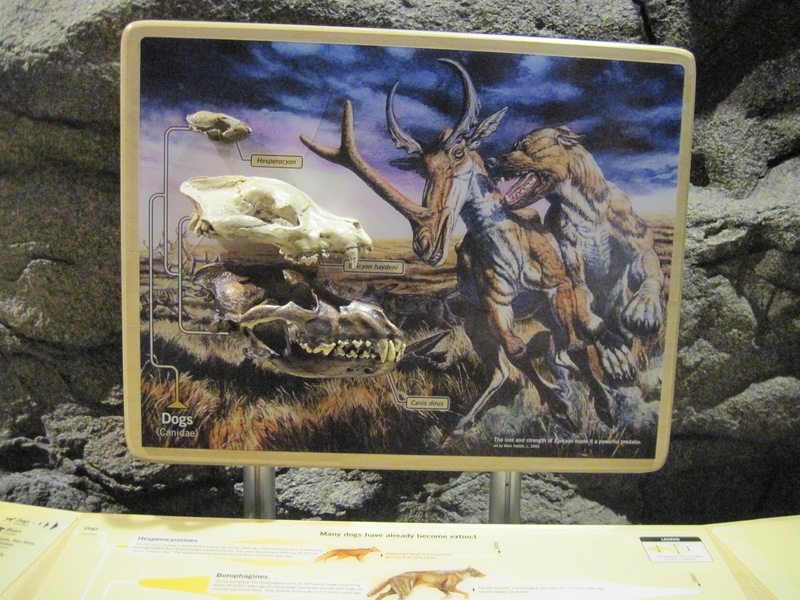 A single station had a few replica skulls of Hesperocyon (an early canid), Canis dirus (the dire wolf), and Borophagus (the bone-crushing dog), and a cladogram showing the relationships of fossil and extant canids. I would have liked to have seen a bit more about the fossil history of dogs, but I guess I’m probably biased. 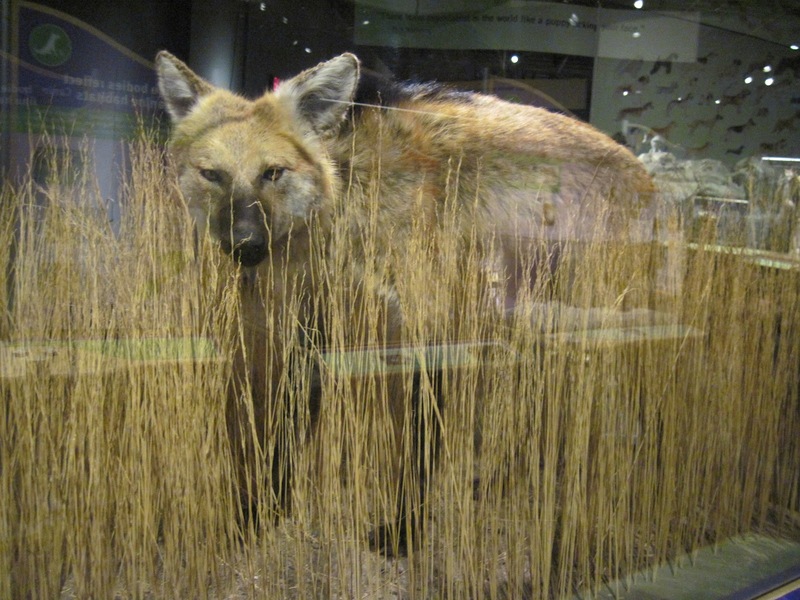 And a maned wolf (Chrysocyon brachyuris). There were also several foxes, a coyote, and a wolf. 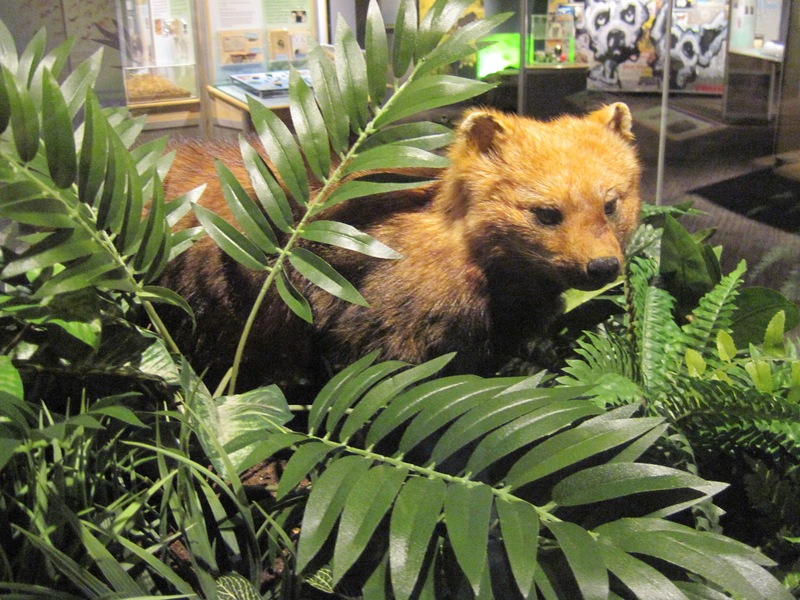 There was a great station where you could listen to a variety of canid vocalizations and their ‘translations’. But much of the remainder of the exhibit, on dog senses and roles in society, fell a little bit flat for me (e.g., a recreation of what it would be like to be rescued by a St. Bernard via crawling into a plastic snow pile; acute sense of smell in dogs demonstrated by wafting weird simulated bacon smell at your face, etc., and some out of place art pieces about dogs in media and life as a wolf). A final criticism was that the exhibit is clearly showing its age, with a lot of scuffed and scratched surfaces and some truly ancient interactive computer stations with roller balls. But the exhibit was reasonably popular on the summer day that I visited, and kids seemed to be getting a lot out of it, so perhaps I’m not exactly the target audience for something like this. I could see this exhibit working very well as a school field trip.